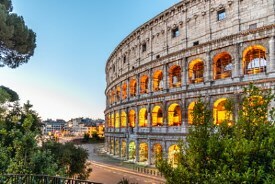 Cruises from Rome (Civitavecchia) depart year-round. In the Eternal City of Rome, Italy you can explore some of the world's most famous churches, monuments and fountains: the Colosseum, the Sistine Chapel, Vatican City, the Spanish Steps and Trevi Fountain (toss a coin in the fountain to ensure your return). Sip cappuccino at a cafe in a piazza or window-shop among the high-fashion boutiques of Via Condotti. Rome is served by the port city of Civitavecchia, located approximately 50 miles away. The Port of Civitavecchia is located approximately 31 miles from Rome's International Airports. Travel time between the airport and the pier is approximately 50 minutes. Taxi fare is approximately 160 EUR. Rates are subject to change. From Fiumicino International Airport (also known as Leonardo Da Vinci Airport) – Take the Autostada E80/A 12 – Roma-Civitavecchia. Exit at Civitavecchia Sud. Follow the signs to the “Sardinia Ferries.” Entrance personnel will provide further details. Once inside the port, signage throughout will direct guests to their assigned terminal.